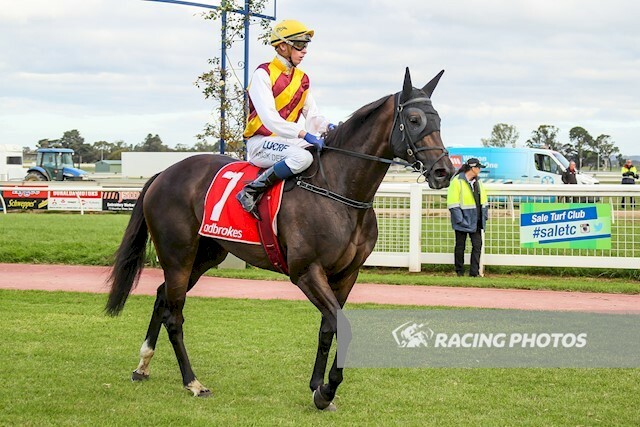 Talented mare Fleeting Feeling produced a strong sprint over the final 300 metres to grab her third career win at Sale on Sunday, March 31. For trainer Tony McEvoy is was the perfect day – one runner for one winner. Jockey Michael Dee was seen to advantage driving the four-year-old mare through on the inside of runners to grab victory. Fleeting Feeling ($5) scored a neck win from Stream Ahead ($13) with Reef Master ($6) a length away third in the JSM Embroidery & Workwear Benchmark 64 Handicap (1100m). McEvoy said today’s win was a pleasing result. “I think we learned a few things from the race,” McEvoy said. “I had been as little disappointed in her because her race manners had not been good – she was aggressive. “I knew she was better than her form was suggesting. “Today, she settled well and was happy racing back in the field, then showed good acceleration. “I also think she likes cut in the ground to do her best. “Her best runs have been when she can get a toe in the going. Winning jockey Michael Dee admitted luck had been on his side. “Coming to the bend I was travelling that well,” Dee said. “I was tossing up whether to come out, but I ended up staying in because there were a few horses outside me. “Lucky enough for me it worked out. “The stable has a good opinion of her, but it has taken a while for the penny to drop because she can do a few things wrong and over-race. Fleeting Feeling cost $260,000 at the 2016 Inglis Easter Sale and is part-owned by Queensland’s Peachester Lodge Syndicate, managed by Linda Huddy.